I guess it's not surprising that I own a few quite random things. Anything usual being sold or thrown away I do tend to pounce on, as well as hording all sorts of junk. W keep talking about clearing out the loft again, but neither of us can really face that mammoth task! Last time we got a quarter of the way in there before retreating with two car loads of boot fair and charity boxes! 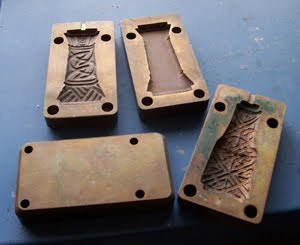 Clearing out the workshop I came across these two moulds I bought years ago at a flea market. I've already posed the question 'what are they' over on Frit Happens forum; although the wise heads and glass addicts there were equally unsure, they all agreed they were excellent things to have! 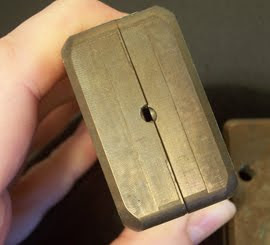 Best guess at the moment is they are injection moulding casts, the material seems to be a copper/copper alloy/bronze, and apparently a beryl-copper alloy is used in some injection moulding machines, plus the sprue hole seems very narrow for normal pouring of casting liquids. The only thing I really am not sure of is what the resultant 'things' were for. One is bottle shaped, the other is column shaped, and both seem to have slightly textured flat backs which I guess are to glue onto something else. If anyone know please tell me, as I'd love to know! We did also 'aquire' for a very reasonable sum a very grand bit of brassware this week, but I'll share some pictures of that next time, when hopefully I figured out what to do with it!